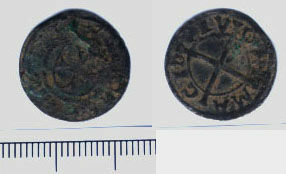 Early post-Medieval hammered coin from Livonia, probably an issue of the Grand Master Hermann Hasenkamp von Brüggeneye (1535-1549). Livonia was an area in the medieval period which is now Estonia and Finland. Obverse description: 4 petalled flower in centre.